I’m heading to Silicon Valley! From the 16th of November until the 28th I will be travelling to the USA as part of a group of Brisbane based founders and tech enthusiasts as part of the Startup Catalyst program. We’re on a mission to soak in the startup culture of the valley and bring back lessons and experiences that we can use to help grow the startup scene here in Brisbane. I’m tremendously excited about going and the rest of this piece will be about what I’m hoping to discover and some initial thoughts. The main draw card for me, other than the potential to have a lot of fun, is the prospect of gathering a global perspective on startups. I fell that without it is easy to box your startup into a local market and miss some of the changes and differences that come from living elsewhere in the world. The opportunity to visit the campuses of places like Google and Facebook is also a great opportunity. I see a lot on line about how these, once startup sized, companies function and knowing how the cogs turn when you move from a team of 5 to a team of hundreds or even thousands is going to be an interesting insight. Having the opportunity to talk to those within the company about this will provide valuable viewpoints into the inner workings. It’s no secret that the Brisbane startup scene is in its early stages. Having the chance to spend time in a mature community of startups will help add another data point to the possibilities of what a mature startup ecosystem could be. I’m not naive enough to think that Brisbane can, or even should, be a carbon copy of Silicon Valley but there is no denying that they’re doing things very well. Working out why, and the foundations needed to nurture that, is something I hope to take away. That’s it for now but I’ll be updating my journey both here and at (http://blog.startupcatalyst.com.au). As always you can reach me on twitter or via email. Stay tuned for more posts and photos. For a while I have been working on a library for Android projects. Nothing fancy just some common code I have used in a couple of games. Until today I was doing it in Eclipse and making a jar file. Android Studio has been out for a while but I hadn’t bothered switching over. Today Eclipse broke so it was time to swap. Honestly it was a pain to figure all this out. Hopefully by posting this it isn’t so much of a pain for you. This guide will show you how to make a project that will contain your library as well as make a second project that uses that library. Neat huh. Here is a list of the versions of the things I had when doing this. I can’t promise it will work for any other version but I will try keep this up to date. You should copy the location of this repository or at least remmeber how to find it because we are going to use it later. 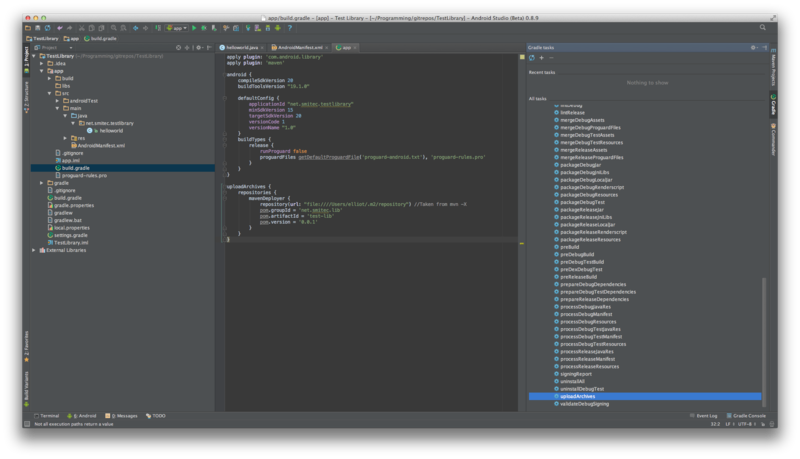 Step 2: Make a new project in android studio. Open Android Studio, make a new project. Call it whatever you like, I made mine a phone project (not wear or glass etc) but I’m not sure it matters. Don’t add and Activity and then press finish. Once you project has been created we will Add/Edit some files. Add a java class and call it anything. Yep anything. Make a function that does something, or ntohing I dont mind. We are making this file just to eb sure it imported correctly. Normally this class and any others you write would become part of your library. Open your AndroidManifest.xml file and remove the application element. Open the build.gradle file within the app directory. Not the global one. This file should have more than one line in it. Change the pom. lines to fit your library name, version etc. Change the repository(...) line to use the maven local repository location we found in step 1. Now run the gradle task uploadArchives. You can do this by opening the gadle tab on the right of Android Studio. Make or open a new project in Andrdoi Studio. Open the build.gradle file for the application (again not the global one). Changing here all parts to match those set in your library. If you now run a gradle sync your library should appear in the External Libraries section in your project tree. You should now be able to use this code in your project. So hopefully that sorted things for you. If not drop me an email/tweet and I’ll check it out. Also I’ve uploaded two projects, one a library and one a tester so you can see everything for youself. Those you can find at https://github.com/smitec/android-studio-library-example if you need. Just a quick post, more to be kept as a Personal milestone. This post will contain a little about our startup (HSK Instruments). I’ll also outline what we’ve been up to and the recent award we recieved. If you are interested in startups, med-tech, cystic fibrosis or anything similar then give it a read. Our startup, HSK Instruments, is working on a product called Pepster. Pepster is a mobile connected, interactive respiratory physiotherapy device for kids with cystic fibrosis (CF). I know that’s quite a mouthful but what it really boils down to is a breathing device that connects to a tablet or mobile. We have anumber of apps, some of which are games, that allow young kids to have a better time doing the physiotherpay they need to keep healthy. We have been working on Pepster since 2012 and we have come a long way. We’ve had over 7 versions of our PCBs manufactured, at least 3 housing designs and countless app itterations. The device is currently in a trial at the Mater Children’s Hospital in Brisbane, 30 kids will take the device home for 6 weeks. While we are talking about it I’d like to put out a huge word of thanks to everyone working on the trial at the Mater. Looking at recent times much of our effort has been on making a trial ready device and looking beyond. We have had some issues in the trial with usb sockets breaking off when they are twisted too much while we personally never had this issue we underestimated the strength of young kids! Luckily for us though we had always planned to remove USB and replace it with bluetooth low energy, so while this was a frustration we are confident it wont be an issue in the long run. While the trial isn’t over yet and I can’t share any clinical results at this stage the anecdotal feedback has been wonderful. Families are reluctant to return the device which is a sure sign that we have created something they love. Our plan from here on out is to make that reality as soon as possible. Thats where the Hill’s Young Innovator award will help us out. The Hill’s Young Innovator award was part of thi year’s (2014) iAwards ceremony and offered a cash prize for an innovator/innovation created by someone under 25. Thats us! Amazingly we won the award. There was some sersiously fantastic competition everything from education to build your own Android tablets! The whole two days of the iAwards were great and we have met some really great people as a result. So while the above probably seems like a rambling, and it kind of is, it’s a record that this happened. If you’re reading this and were a part of the iAwards, someone from Mater, someone from UQ, someone from HSK or just someone I know I would like to offer you a huge thankyou. Nothing we have done would be possible without the great support of everyone I know. If you ever want to talk startups drop me a line. There is a lot of talk lately on the eHalth movement. Apple introduced HealthKit, Google Fit was announced and it feels like every company with a soldering iron is putting together a wearable. As someone who co-founded a startup for medical instruments and is doing a PhD in medical imaging I figured I would share my two cents. For those that don’t like reading overall I think the movement is positive but perhaps just a bad choice of words. If you like reading then I’ll explain some more below. As I said I think the movement towards a more active healthy lifestyle is good. If you build a device that makes someone do 1% more exercise I think you’ve won. The problem I see is framing this as the full span of health. Health is much, much bigger than just calories and steps. It would be great if it wasn’t but it is. This on its own isn’t really a big deal. There are strange semantic things used everywhere that don’t reflect their literal meaning. The problem I foresee (and I do hope I’m wrong) is that the public, and the finance providers (VCs, grants etc.) will come to a stage where a product that saves lives is sat next to a pedometer on steroids. “But your magic box will only help what, 10,000 people? Sorry but this flashy step counter will reach millions, the health market isn’t really aligned with your needs right now. Come back when more people are sick.” Now obviously that’s extreme and I don’t think anyone would actually say that but even a few steps in that direction could be harmful. Again just to be clear I don’t hate eHalth. I bought a fitbit, I use RunKeeper and in the past I have tracked what I eat. Those tools have been useful, some made my do more, others made me eat less. Overall I would say they did make me healthier, but in their own small way. If anyone reading this knows me you will know this is somewhat of a personal worry. Our startup is trying to help improve physiotherapy for people with Cystic Fibrosis. Worldwide there are relatively few people with this condition but in our eyes that doesn’t make it any less important. Sadly not everyone sees it this way, that’s not anyones fault but it is a shame. I put this out there as nothing more than some thoughts. Hopefully though it’s a little step towards understanding. Why I’m Doing a PhD and Why You Might Want to Think About Doing One Too. I’m getting my PhD. Right now I am about a year into it and I’m not looking back. I started straight after getting my previous degree (BE Electrical) because for me now is the best time to be doing it. The following are some thoughts about why I am working towards a PhD and why I did it as soon as I could. To avoid sounding self absorbed I have put this here with the hope that someone like me who needs that final push will come along and convince themselves to enrol in a PhD, my particulars are not overly important here. For some context my PhD revolves around the design and optimisation of gradient coils for MRI. I have a background in electrical and software engineering so for me this was perfect. There are a lot of simulations and coding which I love and also enough experimentation to keep me grounded. A lot of what I do revolves around the mitigation of eddy currents in conductive surfaces. Eventually I plan to write a post outlining these concepts in a simplified way but that will have to wait for another day. I should clarify that where I am (Brisbane, Australia) a PhD is usually 3 years of continuous research. I have talked to others who have course work and other combinations of study in their PhD. Some are longer, I haven’t heard of any much shorter but who knows. As such individual milage may vary here. First and foremost I’m here because I love it. I am extremely lucky to be able to take the time to keep studying, I know there are many others who are not so lucky and sometimes the ‘do what you love’ mantra ignores that fact. Believe me I realise that I’m in a great position. I enjoy the work, even when it’s a grind. The idea that, maybe one day, I will discover or design something brand new is quite an exciting prospect. I have a great amount of freedom in my work (which is probably why I’m in a startup too). As well as that I feel that medical technology is a great use of my skill set. Knowing that I might pay a part in making the lives of others better is very rewarding. I’ve met some of the smartest people in the world in a whole range of fields related to what I’m doing and having the chance to pick their brains is a reward in and of itself. If you finish university and find yourself thinking ‘finally’ then a PhD probably isn’t for you. If you hated study and research then, as it should be obvious, you may want to consider other options. If, however, you left thinking ‘Over already, it was just getting interesting!’ or you’ve been away a while and have maybe changed your mind you may want to talk to your local graduate school. Bachelor’s degrees are, as they should be, more about exposing you to concepts and building a foundation than becoming an expert. As an electrical engineer there are dozens of possible pathways you could follow. There is no way you could become an expert in all of them in a four year period. A PhD (or any post graduate study for that matter) gives you the chance to tunnel deeper into some facet of this knowledge. It’s true that you come to know more and more about less and less but it’s only when you break through the outer crust that you start to see the vast amount of wonder out there. There is also an interesting opportunity to apply skills from other areas in your life to your research. Some of the algorithms and software ‘tricks’ I have picked up over the years have boosted the performance of simulations significantly. In a way a PhD becomes a lot like an apprenticeship, you are mentored by some of the best in your field as you grow into your own. As I mentioned I went straight from my bachelor’s degree to a PhD, this is in part due to the system we have at my university. I thought about it for a long time and I realised that the longer I waited to do it the harder it would be to come back. If I had a family to support, a mortgage, and a well paying job it would be difficult to drop everything and go back to study. I’m not saying it can’t be done but for me I figured now was the time. There are some things that I think a little bit of real world experience can make all the difference but I had aligned myself with some of the best people in my field and I didn’t want to pass up the opportunity. So there is my story, or at least the introduction to it. I love what I do and I’m extrememly lucky to be doing it. I would recommend a PhD to anyone who wants to experience more in their field. I’m not saying you can’t get the experience elsewhere but a PhD is a great place to find it. As always I would love to discuss with other PhD’s or those considering it about their thoughts on the matter. Feel free to tell me I’m wrong, as long as you provide some reasoning. If you want to get in touch with me jump onto twitter or leave a comment wherever you found this article. Also if you are interested you can leave your email address below and I will, from time to time, send you an email about a new post (not all of them though thats what RSS is for). I love vim. I use it for code, notes and blogging (meaning I’m using it right now). It is a great tool with a tonne of smart, powerful features that I have barely started to get my head around. There was a time when my vimrc file was hundreds of lines long filled with all the cool bindings and snippets I found online. Truth is though, I never used any of them. I know what they did but the sheer number of them made it hard to remember and made me frustrated with vim. I knew vim was good and I knew the features were enabled so it must be me thats doing something wrong. So I stopped using it. I got fed up and put it away for another day. When that day finally came I was on a new laptop without my old vimrc. Probably in the best place I could have been. A fresh start. I found the situation a lot like teaching my mum how to send emails. At first I would bombard her with keyboard shortcuts and tricks to save her seconds here and there. In the end I would find myself showing here again and again because I was trying to introduce far too much at once when all she really wanted to do was send an email. Once I noticed this it became much easier to show her new things. I would pick the trick or shortcut that would have the biggest effect and showed it to her. For example cut and paste went down a treat when it wasn’t paired with archiving emails, reply all and how to organise an inbox. Anyway, back to vim. This time was different. I enabled the bare minimum like syntax highlighting and disabled the arrow keys. From there I committed to really learning what vim was all about. I had a post on my old blog about a post by Yan Pritzker (here) which I still maintain is the tipping point for my understanding of vim. I really started to ‘get’ vim and most importantly some of the design ideas behind it. The more I understood the less I needed. I turned on some indenting features for code, a colour scheme and search highlighting but that was it. Sure there are some useful add ons and sure they may increase productivity by 100% but the question I ask is whoes? At this point the gains of adding all the extra modifiers would probably be minimal. My current approach is to just write, when I find myself doing something multiple times I stop and check if there is a better way do to it. Usually there is, without needing to add a new plugin. The new year often brings in changes. At least that sounds like a fine excuse. Truth is I was a bit sick of wordpress bloat and 99% of the posts on my blog get about 4 views a month. With all this at hand I decided it was a good time to move my blog onto a new platform (Octopress for those curious) and start things anew. When I started the blog oh so long ago I wasn’t really sure what I was starting one for, honestly it just sounded like something I should be doing. Since then I’ve tried many thing to keep me posting regularly only to find that at the end of the day I don’t really know why I have a blog in the first place. That’s the first thing I am going to change. Well there it is. A reason. Even if it isn’t a very good one it is a reason none the less. At least now there will hopefully be some focus. Chances are pages will still only get a few reads a month but thats something I can work towards. Secretly (or not so secretly) I’m using this as a way to try and improve my writing as well. I spend a lot of my time writing in acedemia and PR but I never really take the time to practice so thats a bonus goal I suppose of this blog. None the less here is to a new year full of exciting things to share. For a long time I had read and listened to people telling me how excellent Vim was and why it was better then X, Y and Z. Honestly though it has taken my a really long time (say 2 years) to become what I would call average at Vim and understand why it is actually a useful tool. My vim journey began 2 years ago when one of my subjects at university required us to ssh into a remote machine to do all our coding. I’d been coding for a while and I could work my way around the command line if I needed to but I was still very much in the comfortable world of the IDE. I’d traversed from Visual Studio on Windows to XCode on OSX and honestly I was happy. I could compile run debug and do all sorts of tricks with the press of a few buttons and for what I was doing it was more than enough. My first vim experience probably like many others was the built in vim tutorial. I worked through it pretty slowly laughing at the concept of using letters to navigate the screen and wondering why anything needed such a complicated set of seemingly random commands. I printed my vim cheat sheet stuck it on the wall and got to work. As I didn’t really know much about vim I figured I would find a .vimrc online that would solve all of my issues and use that. I read the description and it seemed to fit the bill with features above what I’d hoped for (you can use a mouse!) honestly looking back this was probably the biggest mistake I made, but an important one. Copying the vimrc allowed me to code but the entire time I kind of felt like it was using vim for the sake of using vim. I got slightly faster by the end of the subject and I could use vim if I had to but my command set was entirely made up of the letter i, :wq and the arrow keys to move around the screen. The subject ended and with it my vim usage. during the following 12 months I put an ssd in my laptop and decided rather than copy across all the seemingly useless stuff I would start from scratch and only install what I really needed. With that wipe (unbeknown to me) my seemingly precious copy of the same vimrc I used on the server was washed away into oblivion. Some time later I was perusing Hacker News and saw an article about vim. ‘Hell, why not’ I thought and decided to give the article and vim a chance. I read that article on December 19 2011 (I know because my comment is on the article) and it was like the dirt was washed from my eyes. The article was Learn To Speak Vim by Yan Pritzker and after reading it I finally started to understand the value of the vim editor. Another thing I should probably mention is until about half way through 2012 I could not touch type. Everyone I knew seemed to learn at school but some how I managed to miss out. I could type fast enough for anything I needed to do but Vim without touch typing is about as useful as coding via Morse code. If you cannot touch type and want to use vim, stop right now and learn. I subjected myself to many online children’s touch typing games and whilst I’m still pretty average in terms of accuracy and speed I feel there is a definite improvement. When I first reopened vim I noticed all my syntax highlighting and tab options had disappeared so I decided to remake a vimrc before I started getting seriously back into vim. I thankfully couldn’t find my old vimrc so I decided to write one from scratch. I looked online and saw that the :Set commands i was used to running fit easily into the vimrc and created a basic vimrc that highlighted syntax and used 4 space tabs. Now honestly I didn’t use vim all that much for some time, I had textmate and XCode and never thought to open vim when I decided to code. Every now and then I would be working from the terminal for other reasons and it was most convenient. For one reason or another TextMate became somewhat of a pain for me to use (mainly because I could never remember any of the shortcuts) and I decided to get rid of it. I told myself I would try and use vim whenever I could and the next big step forward came from adding four lines to my vimrc. If you can do this and stick by it your vim productivity will increase significantly. It will be a pain to begin with I promise you that, make sure you know A appends after the end of the current line. You will be tempted to quit or use a mouse but it is worth it in the end. From there it was just a matter of practice and slowly building up my command portfolio. If you can keep this up and learn a command every now and then you should be comfortable in vim in no time. In terms of commands if you find yourself doing something mundane over and over there is probably a command that can help you. Which commands you use often and in what order you learn them is defined by how you use vim don’t be afraid to experiment and go at your own pace. To keep myself from rambling I’ll call it quits here. I’m no vim guru and I still type rather slowly but I’ve come to be comfortable working in vim and can see myself using it (perhaps not exclusively) in the future. If you know any great vim articles I should have a look at please let me know in a comment or an email. This is the moved copy of my old post. Hopefully it all looks the same in Octoproess. If you have issues let me know on twitter. Pictures will be back ASAP. So I’m a pretty big fan of GitHub but sometimes it just isn’t what I’m after. I have some projects that I want to keep hidden away (at least for the time being) and don’t really want to pay for the private hosting features. Sound familiar? Well then you probably want to set up your own Git repository on a machine at home and push to that. If that does sound like something you’d want to do continue reading below. This post is mainly a OSX port of This Article which is a great article, and while a lot of it is the same I hope to cover some of the OSX specifics that I personally found a little hidden when following that article. In order to push and pull from your repositories you need some way to connect to the computer they are stored on. SSH (or secure shell) is the way to do just that. The following steps will help you set up your spare computer for ssh access using certificates only (more on that below). Turning on ssh access in osx is pretty simple all you need to do is open up “System Preferences” and click on the “Sharing” icon. Click the check box for remote log in and give your computer a name (something easy to type is probably not bad idea). Now at this point you have two options, you can allow any user on your computer to sign in or you can create a new user that will just be used for git (perhaps even call them git). I would advise creating the git user anyway as this will make your repository URL much nicer. To create your new git user go back to “System Preferences” and click the “Users & Groups” icon. Just to make sure you have set everything up correctly thus far open up terminal and type the following line on another computer on your local network. you should be asked to add this host to allowed addresses make sure you type yes here. Afterwards you should be prompted for a password, enter the password you assigned to the git user and press enter. If everything worked correctly you should now be connected to your other machine (exciting isn’t it). Now we need to log into the server and tell it to stop accepting passwords. Type in the following commands into the terminal on your non server machine (or if your on the server machine just skip the ssh line). Now save the file (:w) and log out of the machine (ctrl-D). Attempt to log back in and if it worked you shouldn’t have to enter your password. If you are able to try it on a different machine and you shouldn’t be allowed in at all (because you haven’t added that machine’s key). Now there are a few ways to install git and I’ll let you choose your favourite the main thing is you have git installed on both machines. So now that git is set up on both machines we need to set up a repository that you can push to. Ssh into your remote machine and choose/make a directory to store your repositories. In that folder run the following command to create a new empty folder to store our repository in. Thats all there is to it! By using the —bare flag we are saying this is a git repository but only use it to store pushes, in other words nobody will be using this as a local repository. Now head back to your local machine and find a folder to store the local copy of the repo. Run the following commands to setup the repository, add a readme file and push it to your server. And assuming everything was done correctly your repository should have been pushed to the server and you can now use it the same way as you would a github or bitbucket repository. So hopefully this will help someone one day to set things up, if it does feel free to comment below or what not. also if you get stuck anywhere you can leave a comment as well as I may have mistyped a few things here and there. Another thing to note is this will only allow you to log in on your local network to allow external log in you will need to set up either a fixed IP for your router or configure a service like dyndns. These are both outside the scope of the article but there is a bunch of info around the web on doing both of these things. Other than that happy coding.